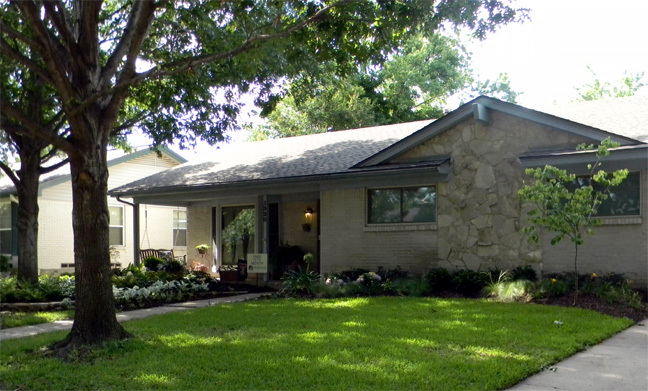 The home of Brad and Amanda Moulton at 1320 Chippewa is recognized as the June 2012 Yard of the Month. We moved to Chippewa eight years ago after attending Texas Tech. I grew up in East Richardson and chose to move back to the area after college when my wife and I both found jobs in Dallas. We have enjoyed living in the Reservation due to its great location, big trees, and wonderful neighbors. Having not done any major yard improvements over the years, it was finally time. I needed to come up with a plan that was within our budget and that we could easily maintain. As a landscape architect it was hard to commit to a project at my own home when I would be “playing” with our own space and money. There are two large red oaks in the front yard and we only get about 2-3 hours of sun a day. It was difficult to sustain any turf under the west tree so I designed a raised bed around the tree. A low stone wall edges the bed and makes a level plating area back to the house. The bed is filled with shade loving plants: ferns, gardenia, hydrangea, pittosporum, hosta, caladium, and a lace leaf Japanese maple. The east bed gets the most of the few hours of sun we receive. The plants in this bed are: agapanthus, azalea, hydrangea, feather grass, day lily, loropetalum, and a red bud tree. We had 9 cubic yards of soil brought in for the project. The east bed was excavated about 18” and replaced with an azalea mix in hopes to have the plants thrive in their preferred soil. The soil that was removed was used to raise the west bed and was also amended with new topsoil. We will eventually add a stone pathway from the driveway to the front door and new gutters that will collect in a large rain barrel on the side of the house. By improving the front yard we have spent much more time on the front porch with our six month old daughter and have enjoyed interacting with the neighbors as they walk by.